The United Soccer Leagues, LLC, announced today it has entered a multi-year partnership with Western Specialty Contractors, which will make the largest network of specialty contractors in the United States the Official Stadium Restoration Supplier for all related properties, including the United Soccer League, USL’s Division III, the Premier Development League (PDL) and the Super Y League. 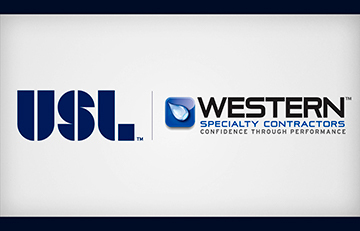 Western Specialty Contractors becomes the latest member of the USL’s Preferred Supplier Program, which has grown rapidly alongside the league to provide high-caliber services to the league and its clubs. Established in 1915, Western’s goal has been to provide masonry, concrete and waterproofing solutions that will stand the test of time. The organization’s unrivaled standards mean its customers can count on Western as a reliable, long-term partner that produces outstanding work every time. With over 30 branch offices nationwide, Western’s skilled workers provide services that prevent elemental damage to concrete or appropriate restoration when deterioration has occurred, something that is paramount to the longevity of buildings, balconies and plaza decks. The USL is one of the most prominent Division II professional soccer leagues in the world, reaching a population of more than 75 million people to fuel the growth of professional soccer across North America. Headquartered in Tampa, Florida., the USL provides unparalleled club support with a growing team of more than 50 professionals across 17 departments, ranging from operations to marketing, communications and sponsorship. The USL has national media partnerships with ESPN and SiriusXM, and operates USL Productions, which includes a state-of-the-art facility that will produce and distribute more than 500 league matches and more than 1,000 hours of original content to national partners, local affiliates, the USL’s Match Center and international markets over the 2018 season.